RESEARCH. Stakeholder Interviews. Brand & Business Audit. Competitive Analysis. IDENTITY. Naming & Tagline. Logo Design. Stationery. Brand Guidelines. Unibev was born out of the corporate rebrand of a business formerly christened as Uber Blenders and Distillers, a new entrant into the world of alcobev and non-alcoholic drinks and mixes. 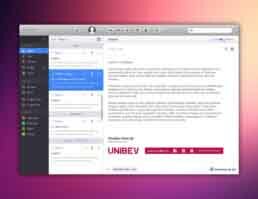 The company had adopted the name Uber Blenders and Distillers in order to register and launch itself. Post registration and formation of a legal entity, the management team believed that they needed a superior name and decided to go in for a corporate-level rebrand. Crosspollen was tasked with the responsibility of creating a new corporate brand name, logo and brand guidelines. We conducted an audit of beverage manufacturers to learn about corporate level naming conventions in the industry. We coined the name Unibev from the words ‘Universal’ and ‘Beverages’. The visual identity was crafted in the style of a stylized wordmark using a straight and elegant font, set in a maroon colour, with a grappa glass in the negative space in the letter ‘U’. 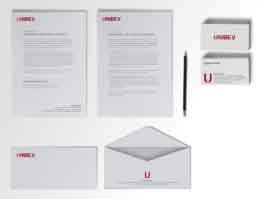 Next we developed a corporate identity kit consisting of business cards, envelopes and letterheads. As the final step, all brand elements were captured and set into comprehensive corporate brand guidelines. The rebranding was a success with the client team and its investors appreciative of the final output and agency effort. 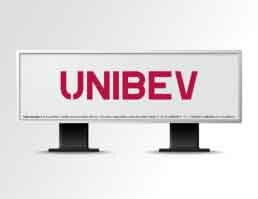 The new name and identity provides a strong platform for Unibev to boldly launch a variety of relevant beverage products under its banner.